When love is all around everything seems to be perfect. 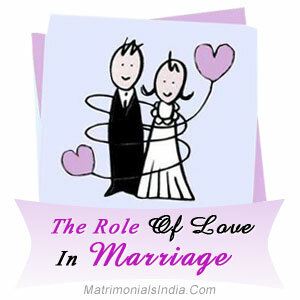 Love is important for two people who marry and make a vow to support each other in good times and bad. Love is an emotion that strengthens the bond between the two. Although, love is not everything that makes a marriage successful but two people can handle their problems in a better way if love exists in a relationship. Love is a commitment you make to your partner that even in adverse situations you will support him/her & forgive and forget if any disagreements happen. A situation may arise in a marital relationship when arguments reach such a stage that it feels as if no compromise is possible. This is the time when love comes to the forefront & is sometimes the only factor that decides the fate of the marriage - whether it will be successful or doomed to fail. The love between partners needs to be kept alive always in order for the marriage to last. It is always the combined effort of the two people that makes any marriage a successful one. Love could mean different things for different people. For some it could be all about making your partner happy, for others it could mean believing in their partner even when others don't, for yet others it may mean accepting the partner as he/she is. Definition of love could be many but the essence remains the same - being there for each other always.